After announcing earlier this year that it is building a 2,000 horsepower, hybrid semi-trailer truck, the Nikola Motor Co. revealed today that it will instead power the truck with a hydrogen fuel cell power system. The Nikola Motor Co. had been offering 100,000 gallons of free natural gas for the first 5,000 reservations for the Nikola One. The company has already received 7,000 reservations. Nikola Motor founder and CEO Trevor Milton also announced that the electric class 8 semi-truck, dubbed "Nikola One" will be unveiled Dec. 2 in Salt Lake City. The truck will retail for $375,000, which is nearly double the price for a standard diesel semi-trailer. The company said it will offer a leasing plan that will run from $4,000 to $5,000 per month, depending on the configuration and options a customer chooses. 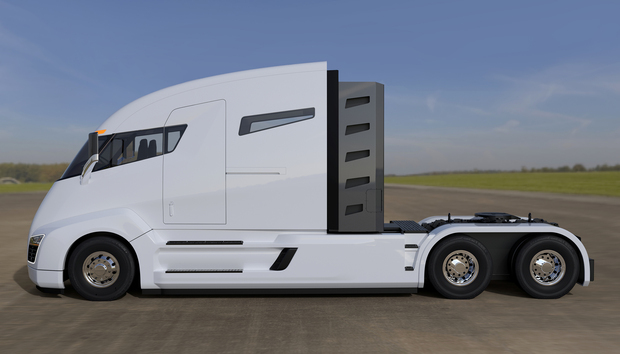 The semi-trailer was originally to sport a 320 kilowatt hour (kWh) lithium-ion battery pack, along with a 150-gallon fuel-agnostic turbine, which could be configured to run on various kinds of fuel, including diesel or petroleum. The standard model was to have a natural gas tank. The company had not responded to a request for further information about fuel options at the time of this article's posting. In May, Nikola began taking $1,500 refundable reservations for the Nikola One, offering 100,000 gallons of free natural gas to the first 5,000 trucks reserved. The natural gas was to be retrieved through a network of compressed natural gas (CNG) stations throughout the U.S.
By June, the company said it had more than 7,000 paid reservations that would translate into $2.3 billion in truck sales when it ships. The interior of the Nikola One semitrailer. As a hydrogen fuel cell-powered tractor-trailer, it will still be an electric vehicle. The hydrogen fuel cells generate electricity, which power the vehicle's electric motor. While the Nikola One will have up to 2,000HP, most of the time it will likely only need 400HP to 500HP to haul its loads. "The reason for the horsepower increase is that with electric motors, you only use what you need, unlike a diesel engine, so most of the time, you will only need 400 to 500 horsepower out of the 2,000 HP," a spokesperson for Nikola Motor Co. said in an email reply to Computerworld. "You don't waste any energy that you don't use with electric motors. But when going up a hill ... with the extra horsepower, the electric allows you to climb to full speed limit." Nikola Motors also claims the truck will achieve nearly 20MPG of hydrogen fuel with zero emissions under full load, surpassing all the government mandates set forth for the next 10 years, including the Environmental Protection Agency's recently announced Phase 2 GHG standards. The new standards, which begin in the model year 2021 and culminate in standards for model year 2027, would require fuel consumption of tractor trailers to drop as much as 24%. The Salt Lake City startup also plans to produce hydrogen fuel via its own zero emission solar farms. The solar farms are expected to produce more than 100 megawatts of power each and will use electrolysis to create hydrogen from water. "Even our manufacturing facilities will be run off zero emission hydrogen energy," Milton said in a statement. "The desire to be 100% emission free in the U.S. and Canada is a critical piece of our long-term engineering and environmental efforts, not just in vehicle energy consumption, but also in how energy is produced." Nikola plans to have a nationwide network of more than 50 hydrogen stations for customers to begin fueling by 2020. This will make Nikola Motor Company the first company in the world to be 100% emission-free from energy production to transportation to consumption, according to Milton. "Say goodbye to the days of dirty diesels and after treatment in the heavy duty class 8 market," Milton said.